Below is a list of group classes that I teach in the area. Couples are encouraged but singles are also welcome - although a partner cannot be guaranteed. Please do not wear tennis shoes or sandals. Hard sole shoes are best! by the series for $35 for a 4 week series, or you may purchase a 8 class card for $70. Don't forget to ask for your punch card for either the drop-in/series class or the 8 week card. 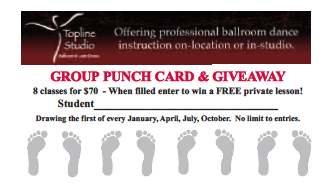 When you fill your card you may turn it in to be eligible to win a FREE PRIVATE LESSON! Classes are open to both members and non-members. Please contact the WAC locations to register for a class! 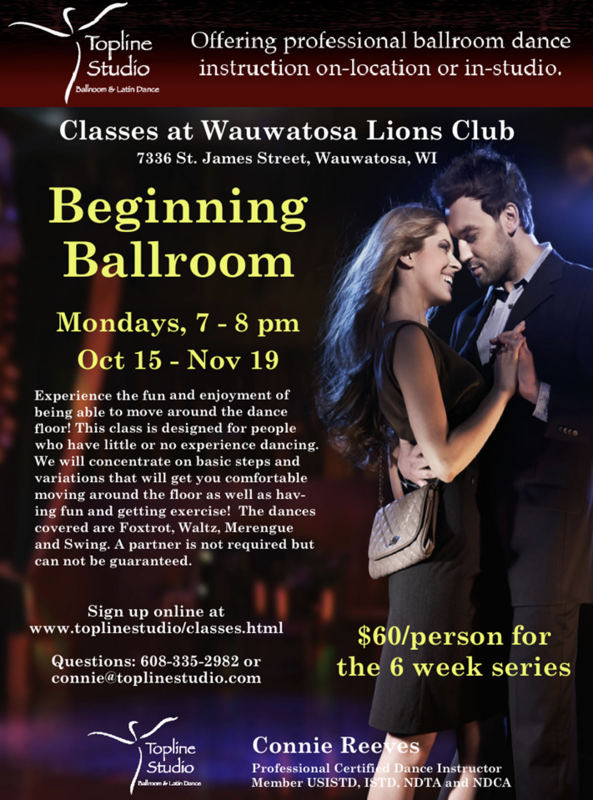 Unless otherwise noted - all group classes at East Towne Ballrooms require no pre-registration and you can just show up. or those who have some dance experience and want to brush up on their skills. classes to attend. You will learn the basic steps to the dance, how to lead or follow and then dance the steps to music. also have the optional opportunity to take a medal test to achieve recognition from the USISTD including a certificate and medals. Classes are drop in and you don't need a partner to attend. Singles or couples welcome. Classes are open to all levels of students and you don't have to be a student of the studio. Pre-registration is not required. Cost is $10 per person per class date.